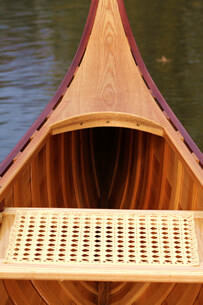 Wood and Canvas Canoes are constructed with White Cedar ribs and planking. 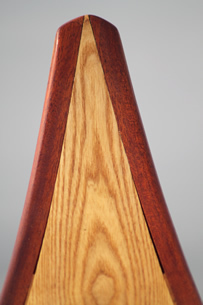 The base price model is built with Sitka Spruce inner gunwales, Ash outer gunwales, Ash decks, thwarts and stems, Shaw & Tenney Ash mat-caned seats, Silicon Bronze bolts and ring nails, and a curved Ash Yoke with pads. The canvas is filled with an enamel silica based filler, and then painted with top quality marine enamel. Spar varnish, brass tacks, screws, and stembands are used throughout. Visually the lines of Bourquin canoes are similar to those of the old E.M. White canoes first produced in Maine over 100 years ago. 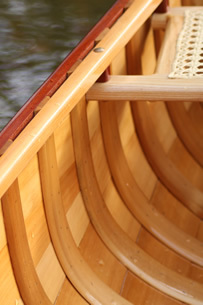 Custom Built means flexibility in all aspects of construction; handcaned seats, slat seats, solo paddling thwarts or seats, shellac bottom, Cherry or Mahogany instead of Ash for decks, thwarts, seats or gunwales. Seat placement can be changed, and virtually any color of paint is possible. There are also times when you can come to Ely and build your own canoe, or just come up and help with it as much as you like. 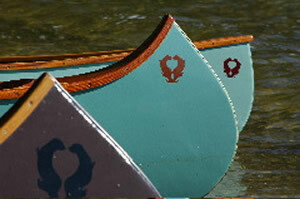 On the phone, you asked what influenced us to purchase one of your canoes. The answer is varied, but we were impressed with your talent reconstructing your home, wilderness tripping experience, honesty and perhaps most of all, the meticulous workmanship and beauty of your canoe, together with the friendliness you showed Sam and me. I had no intention of buying a wood canvas canoe when we met you for the first time. After paddling your canoe, I was convinced we should own one." The usual wait for a Bourquin Boat is six to eighteen months. Occasionally there are new canoes for sale in area stores. We can talk specifics and I will take your order over the phone, 218-365-5499. I require $400 as a downpayment with your order, $1000 more when I start your canoe, and the balance when you pick up your canoe. There is 6.875% MN Sales Tax.